SpongeBob lives in a pineapple under the sea. LOS ANGELES, California (Reuters) -- Conservative Christian groups accuse the makers of a video starring SpongeBob SquarePants, Barney and a host of other cartoon characters of promoting homosexuality to children. 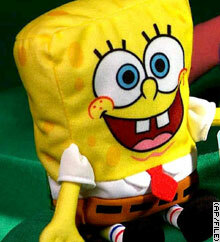 The wacky square yellow SpongeBob is one of the stars of a music video due to be sent to 61,000 U.S. schools in March. The makers -- the nonprofit We Are Family Foundation -- say the video is designed to encourage tolerance and diversity. But at least two Christian activist groups say the innocent cartoon characters are being exploited to promote the acceptance of homosexuality. "A short step beneath the surface reveals that one of the differences being celebrated is homosexuality," wrote Ed Vitagliano in an article for the American Family Association. The video is a remake of the 1979 hit song "We Are Family" using the voices and images of SpongeBob, Barney, Winnie the Pooh, Bob the Builder, the Rugrats and other TV cartoon characters. It was made by a foundation set up by songwriter Nile Rodgers after the terrorist attacks of September 11, 2001, in an effort to promote healing. Christian groups however have taken exception to the tolerance pledge on the foundation's Web site, which asks people to respect the sexual identity of others along with their abilities, beliefs, culture and race. "Their inclusion of the reference to 'sexual identity" within their 'tolerance pledge' is not only unnecessary, but it crosses a moral line," James Dobson, founder of Focus on the Family, said in a statement released Thursday. Rodgers said he was astounded by the attack. "That is so myopic and harsh," he told Reuters. "You have really got to look hard to find anything in this that is offensive to anyone. The last thing I am going to do is taint these characters." Dobson was quoted by the New York Times on Thursday as having singled out the wildly popular SpongeBob during remarks about the video at dinner this week in Washington, D.C.
SpongeBob, who lives in a pineapple under the sea, was "outed" by the U.S. media in 2002 after reports that the TV show and its merchandise are popular with gays. His creator, Stephen Hillenburg, said at the time that though SpongeBob was an oddball, he thought of all the characters in the show as asexual. It is not the first time that children's TV favorites have come under the critical spotlight of the Christian right. In 1999, the Rev. Jerry Falwell described Tinky Winky, the purse-toting purple Teletubbie, as a gay role model.